Imagine this: You’re twelve-years-old. You go to the Something-or-Other School in Small Town, USA. You play piano, but not well – your mom makes you go to lessons and you can’t wait until you can quit, but you know your scales and arpeggios. You have a dog named Oscar. Oscar is the same age as you, and he sleeps at the foot of your bed. You wake up one morning. It’s 10 am. You’re a little surprised that your mom let you sleep in on a school day...but then, is it a school day? You’re not sure. And where’s Oscar? He’s not at the foot of your bed. And the room you’re in – this isn’t your room. The furniture is different. All the pictures on the walls are gone. You start to get nervous. You get up, walk to the mirror, and give yourself a look. The person looking back isn’t you! It's some thirty-year-old! You poke your cheek. He/she pokes his/her cheek. You look closely, and realize that you and the mystery mirror-person have the same eyes. The person in the mirror is you! You are thirty years old! And you have no idea what happened in the last eighteen years. This is when the doctor comes in and explains things. Eighteen years ago, when you were twelve, you had an accident. Your brain was injured. You can’t form new memories. You remember everything you learned before the accident. But you forget everything new within a few minutes. You don’t know the doctor’s name. You don’t recognize her at all. But she knows you. She’s worked with you for the last eighteen years. You can still play piano. You’re better at it than you were when you were twelve. This scenario may seem like something out of a bad soap opera, but it’s actually happened. Meet Henry Molaison. Neuroscientists call him H.M.
H.M. in 1953, before the surgery. From wikipedia. 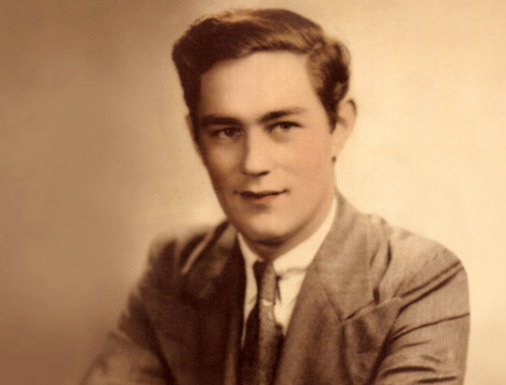 In 1953, when H.M. was 27, he had brain surgery to fix his epilepsy. People with epilepsy have seizures.) The doctors planned to remove part of H.M.’s temporal lobe in order to cure his epilepsy. But in 1953, we didn’t know much about the parts of the brain. The doctors took out too much brain, and when H.M. woke up, he couldn’t form any new memories. And so a whole new field of neuroscience was born...the study of memory. H.M. is the most famous patient in all of neuroscience. Neuroscientists think of him with something close to reverence, because we learned so much from him. I study learning, memory, and neural development. My work, and the work of many other scientists, builds on what we first learned from H.M. The doctors removed H.M.’s hippocampus. Thanks to H.M., we now know that the hippocampus is the part of the brain responsible for long-term memory storage. Specifically, it is responsible for declarative memories. Declarative memories are things like your dog’s name, what you had for dinner yesterday, and who the President of the United States is. It’s your autobiography. Imagine what it would be like, if you could no longer form new memories about yourself, your life, or the world around you. 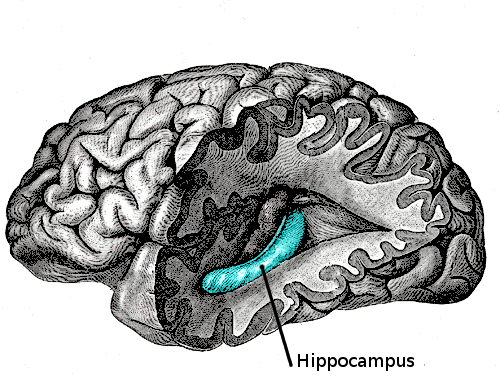 The hippocampus is also critical to spatial memory, or memories of the environment around you. When you remember that that your sofa is here and your bed is there, that's your hippocampus working. The brain with the temporal lobe cut away, showing the hippocampus. The hippocampus is the part of the brain responsible for long-term, declarative memories and for spatial memories. From wikipedia. Thanks to H.M., we also know that there are lots of different types of memories, and they aren’t all stored in the hippocampus. For instance, H.M. could form new motor skills. Motor skills are tasks that require muscles, like cycling or swimming. So we know that muscle memory isn’t stored in the hippocampus, and that is works differently from declarative memory. The condition HM had is called anterograde amnesia (which means approximately “forgetting going forward”, or the inability to form new memories). I also have to mention Dr. Brenda Milner, the neuroscientist who worked closely with H.M. after his condition was discovered. Without her work, no one would know who H.M. was. H.M. died in 2008. Even in death he continues to teach us. The University of California, San Diego, acquired his brain and did a live dissection, streaming it all over the internet while they began the process of studying the neurons of H.M.’s brain. I remember this. A celebrity had just died. It was huge news. The dissection ran live on all the computers in my lab. The sadness and respect we felt at the news of H.M.'s death didn't stop up from gluing our eyes to our monitors. Yes, we’re nerds. For over fifty years, H.M. taught neuroscientists about memory. But because he couldn’t form new memories, he never knew how much he meant to us.